This is a tad unorthodox for my blog; but seeing as my opening night review–last week–of Calgary Opera’s The Mikado has not yet gone live on Huffington Post Alberta, I thought I may as well share it here while there’s still time for Calgarians to take in this wonderful show. It was an uncharacteristically warm evening last Thursday, August 13, as W.S. 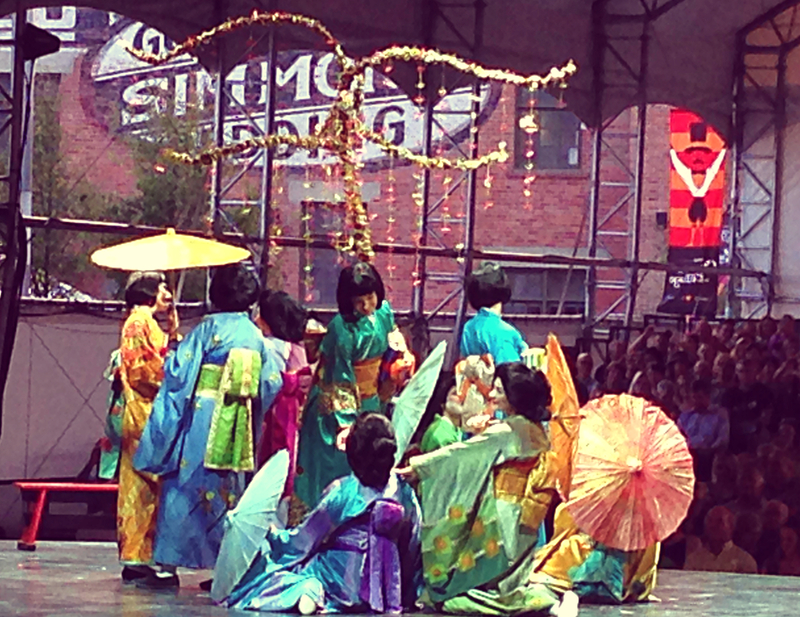 Gilbert and Arthur Sullivan’s The Mikado premiered in Calgary’s East Village, marking Calgary Opera’s third annual Opera in the Village. Opening to an all-but-full house, I was admit I was surprised to see the smattering of empty seats on such an idyllic night. With the recent retrofit of the historic Simmons Building — which now houses Charbar, Phil & Sebastian, and the delectable Sidewalk Citizen Bakery — the plaza was a bustling scene of food and drink, music and laughter both before and after the performance, as well as during the 30-minute intermission. Along with the usual fare of beverages —alcoholic and non-alcoholic — candy and popcorn, local gourmet ice pops vendor, Family Freezed, offered up a tasty array of frozen confections to while away the moments between acts. Gilbert and Sullivan’s campy, screwball-esque comedy production is a satirical romp set in “exotic Japan”. With deliberately laughable character and place names, The Mikado pokes fun at the British political system, setting their criticism of Queen and country in a distant locale to soften the impact of their pointed satire. As the sun slowly dipped below the city skyline, The Mikado opened on Nanki-Poo (Martin Sadd, tenor) returning to Titipu in search of his love, the beautiful Yum-Yum (Eve-Lyn de la Haye, soprano). Through a heartfelt soliloquy we learn that sometime prior Nanki-Poo — a second trombonist with questionable talent — met and instantly fell in love with the lady Yum-Yum; unfortunately her aged guardian, Ko-Ko (David LeReaney, baritone), had likewise fallen under Yum-Yum’s girlish charms and chose to make her his bride-to-be. When Nanki-Poo learns that Ko-Ko has been sentenced to death for the capital crime of flirting, he rushes to Titipu in the hopes of finally making Yum-Yum his own. Arriving in Titipu, Nanki-Poo is saddened to learn that not only has Ko-Ko been spared, but, through a series of remarkable coincidences, he is now Lord High Executioner. Things worsen further when the Mikado, Emperor of Japan, alarmed at the lack of executions in Titipu under Ko-Ko’s rule, has decreed that someone must die within the month or Ko-Ko himself must surrender to the blade. Each year, Opera in the Village allows for a “Photo Op”–a moment in the production where actors “freeze frame” to allow the audience a photograph. This is one such grainy photo, taken on my iPhone. Heartbroken over his separation from Yum-Yum, Nanki-Poo enters the scene prepared to take his own life when the two lovelorn men arrange a bargain that suites them both: Nanki-Poo will marry Yum-Yum for one month, after which he will be put to death, thus fulfilling the Mikado’s edict whilst leaving the widowed Yum-Yum free to wed Ko-Ko. With the wedding planned for the next day, all seems to be — more-or-less — favoring the young couple at last when a little-practiced law forcing a wife to be buried alive alongside her convicted spouse threatens Nanki-Poo’s deal with Ko-Ko, as well as Yum-Yum’s life. Things grow further complicated when Katisha (Lauren Segal, mezzo-soprano) arrives in Titipu in search of her betrothed, Nanki-Poo, who is not a simple minstrel, but rather the only son and heir apparent of the great Mikado. Calgary Opera’s take on Gilbert and Sullivan’s much-loved The Mikado is perfectly silly, providing a fun, accessible operatic experience for young and old. As with past Opera in the Village presentations, the set was simple yet elegant, making skillful use of the confined space: a decorative cherry blossom tree takes center stage, with a balcony to the north providing actors with a versatile range of steps and locales from which to address the audience or “hide” from the main stage goings on. While beautifully-crafted and visually-enticing, the economical design likewise affords audiences an excellent view from every angle of the now familiar tent, utilizing public doorways, steps and corridors for the occasional entrance and egress of performers. The costumes were — in typical Calgary Opera fashion — an array of elaborate kimonos in a spectrum of vibrant colors, lush fabrics and intricate patterns, accentuated by the elaborate hair pieces and playfully ostentatious makeup worn by both men and women. While every Calgary Opera performance is of the highest musical quality, the clarity of delivery in both solo and ensemble pieces, as well as the general timbre of the vocalists in this year’s The Mikado, was a testament to Calgary Opera’s impeccable standards. Accompanied by a small ensemble under the direction of Resident Conductor Christopher Mokrezewski, the orchestra was equal parts mellifluous support, standout soloist, and playful co-conspirator to the onstage antics. Martin Sadd’s tenor was smooth and rich, never faltering, but instead, playfully intonating the struggles of poor, bereft Nanki-Poo. Though he had only one solo early in in act one, David Diston (as the nobleman Pish-Tush) gave an extraordinary performance, his sonorous baritone illustrating the high quality of Calgary Opera’s male talent, so much so it’s almost a shame he was not featured more. Sopranos de la Haye, Jennifer Sproule (as Pitti-Sing) and Laura Brandt (as Peep-Bo) were a dulcet trio throughout the night, particularly in The Mikado’s trademark “Three Little Maids”, with de la Haye’s solo aria in the early moments of the second act (“The Sun Whose Rays Are All Ablaze”) delivered with particular artistry. But the stand-out female voice was mezzo-soprano Lauren Segal, whose impressive range, depth and intonation was matched only by her expressive intensity. Though she has only one solo late in the second act (“Alone, and Yet Alive”) with contributions to several other pieces throughout the production, Segal’s resonant mezzo and theatrical delivery make The Mikado a performance to remember. As in previous years of Opera in the Village, The Mikado is littered with local references, with Gilbert and Sullivan’s classic ballads masterfully reworked to name drop Mayor Nenshi, our friendly rivalry with nearby Edmonton, vandalism on Calgary Transit and more, to the obvious delight of the audience. Another crowd favorite was the return of David LeReany as the kindly and somewhat kooky Ko-Ko. LeReany — known from theatre, television and film — has manned similar roles in each of the past Opera in the Village productions: as the Modern Major General in The Pirates of Penzance (2013), and again as Voltaire/Pangloss in Candide (2014). While his voice is not the polished operatic of his cast mates, he is a talented performer whose comedic presence is a happy addition to the stage. Calgary Opera’s unabashedly goofy The Mikado is a pure treat, produced and performed with such expertise as to appear effortless; it’s a welcome break from the responsibilities of daily life and will leave the audience refreshed, whether it’s your first or fortieth Calgary Opera production. Opera in the Village runs until August 22, with tickets ranging in price from $35 to $60 and available online at calgaryopera.com/festival. Special Friday afternoon and weekend presentations leading up to The Mikado — including $15 tickets to an all-ages production of The Scorpions’ Sting (Dean Burry), outdoor aria performances, and family-friendly activities — as well as an upcoming evening screening of Rocky Horror Picture Show on August 21, make this annual festival one to cross off your attendance list year after year after year. Shannon McClennan might know a little bit about music. A soprano, Shannon has more than 20-years of vocal experience—including stints with the Mount Royal Youth Choir, University of Calgary Women’s Chorus, University of Calgary Chorus, and Mount Royal Kantorei, among others. She’s not a professional theatre critic or musician, but she can recognize a flat when she hears one.